Southam United are searching for a new manager after Ian Ray stepped down following their humiliating 15-0 defeat at Racing Club Warwick on Boxing Day. 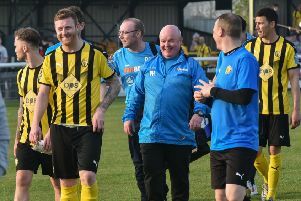 Saints, who have yet to win in Midland Division One this season, started the match with ten players and were forced to play the second half with just eight after picking up two injuries. Outgoing Southam boss Ian Ray. Chairman Charles Hill said: “Clearly the season has not gone the way we had hoped and despite all of Ian’s hard work, and that of his staff, the cumulative effect of being continually let down by players combined with increasing pressures of work and bringing up his young family, meant that Ian had told me ten days ago of his intention to resign after the forthcoming Copsewood game. “However, being let down again at Racing Club, resulting in the team having to play the second half with only eight players, with the inevitable outcome as far as the result was concerned, he felt it would be best to step down immediately. Ray issued a statement to the Leamington Courier and Kenilworth Weekly News in which he highlighted the difficult conditions under which he has had to operate. However, he said he remained grateful for the opportunity to step up to lead the senior side. “I’m very disappointed in how things have turned out,” said Ray. “Having been attached or associated with the club for nearly 17 years, watching from the outside last season was heartbreaking and I felt I had to give it a go to turn things around even though I’ve never really been interested in being a manager at first team level. “I’m grateful that Charles gave me the opportunity to try to do so. “Despite great support from my staff ultimately I wasn’t able to turn things around. When I took over, unlike previous managers at Southam, we had virtually no players from the previous season leftover, no reserve team and no youth team to build from. “So unlike previous managers, I was starting from scratch. “As a new team thrown together we were very inconsistent as you’d expect although It didn’t help I was never once able to pick the same starting 11 two games running all season. “I felt at one stage we were almost there with some encouraging performances despite the run of defeats from September. “Unfortunately things changed after the league defeat against Stafford. He added: “For health and personal reasons I informed Charles that I would be resigning my position as manager so that someone new could breathe life into the team. “I’d like to thank my staff, Brian Halpin, Andy Williams, Alex Baird and Simon Reading who’ve provided outstanding support and who have been a pleasure to work with. Player-coach Alex Baird, who is currently recovering from a serious knee injury, has been put in temporary charge for Saints’ next match, away at Coventry Copsewood on Monday.